For full facility rental rules and procedures, please read the rental terms. For more information please contact our Events Department at Events@FrankLloydWright.org or call 602.800.5456. The Cabaret Theater is where Wright’s love of Asian art is most elaborately illustrated, with a large Chinese dragon motif emblazoned on the double doors and the central display of a Ming Dynasty cast-iron Buddha head. The cabaret allows your guests to make use of original Wright-designed chairs, seats, and tables, while the unique shape and construction of the space create optimal acoustics so that someone sitting in the back row can hear a faint whisper from the stage. Your guests will savor their time on the Cabaret Terrace surrounded by Wright’s famous organic architecture. The panoramic views overlooking the Sonoran Desert and the lights of Scottsdale create the perfect intimate setting for your event. ‘Aiming for the Mark’, a bronze sculpture of an archer created by Wright’s apprentice Heloise Crista, welcomes you to the Garden Squares. This vast event space at the heart of Taliesin West is surrounded by the Pavilion, Wright’s office, and the Drafting Studio, so that your guests are immersed in all things Frank Lloyd Wright. This space is large enough for any event you can dream up. The Kiva, which gets its name from an underground chamber used by Pueblo Indians for religious rites, was one of the first structures built on the property. It has served as a dining room, movie viewing room, lounge, and library. This hidden treasure has five different lighting techniques designed by Wright which create an inviting ambiance for any select event. 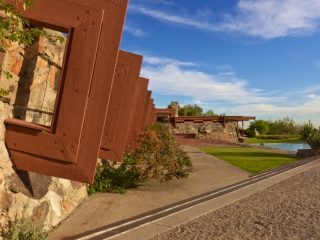 Opened in 1957, this is the last structure Wright added to Taliesin West. A symphony of red seats, curtains, and carpeting celebrates what Wright believed to be one of the life-giving colors of creation. The Pavilion continues to function as a multi-purpose hall for exhibitions, concerts, parties, and public meetings. Situated just outside the Music Pavilion, the Pavilion Terrace features Wright’s former apprentice Heloise Crista’s many sculpture masterpieces. Take in breathtaking views of the Valley from this serene space. The Sunset Terrace is a triangular terrace that steps down gradually to the Prow. On the east, the terrace faces the garden room (1940), the Wright family’s living quarters. At the front of Wright’s desert laboratory masterpiece is the Prow, a triangular garden and lawn with geometric beds filled with native plants that extends out to the view that Wright called “standing on the rim of the world.” There is no better view in the Valley than the Prow at sunset, while the main buildings Taliesin West and the backdrop of the McDowell Mountains softly change color as day flows into evening. The Prow is a full 360 degrees of splendor and awe.